Evening Lecture: Too Much of a Stretch? Can or Should Christians Practise Yoga? Date: February 28, 2018, from 7 to 8 p.m.
A recording of the presentation can be viewed here. Millions of people in Canada and the United States practise yoga these days. Many are Christians. While some practise yoga simply for perceived health benefits, many find it a helpful spiritual practice. Is yoga, in fact, a spiritual practice that Christians can legitimately undertake? What about the warnings against yoga that are heard from some churches, ranging from the Catholic Church to various evangelical denominations? Are Christians misappropriating the cultural or spiritual practices of Hinduism? The webinar will address these questions and try to situate contemporary Christian practice within the larger context of modern postural yoga. 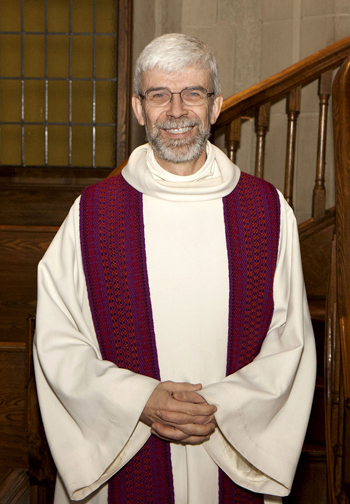 The Reverend Kevin Flynn is a priest of the Anglican Church of Canada and the Director of the Anglican Studies Program in the Faculty of Theology at Saint Paul University, Ottawa. He served various parishes in Toronto before taking up the work in Ottawa. He has practised yoga for over 30 years and is a certified Hatha yoga teacher. His Doctor of Ministry research has focused on the experiences of Christians who practise yoga. Professor Flynn teaches in the areas of pastoral practice, liturgy, ecumenism, and spirituality. This lecture will be presented at Saint Paul University and by webcast simultaneously.